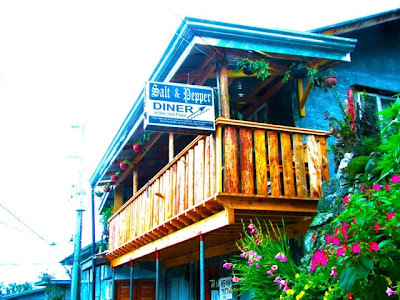 Many Tourists, wanted to taste those native dishes.. well, this will solve your Queries..
Salt and Pepper, one of the friendliest dining establishments in Town. for Queries and Reservation: contact "Safey"
kapal, todong pictorial si erwin. hahaha. nice photos. i will soon post my review of salt and pepper. congrats to the pekas. Salt and Pepper Diner indeed gave my team a genuine Sagada meal-- too bad we requested it to be served in styro dishes since we were all in a hurry. Nevertherless, the meal was sumptuous and authetically Sagada! Safe and Andrew were very accomodating in their 80-year-old ancestral house-turned-diner. intu nan kad-an nan diner ay nay? I love Salt n' Pepper. Safe was very accommodating. We were there two days after they opened in April. Their Pinikpikan, Dinakdakan and Pakbet are musts when going to Sagada. Authentic and really worth it. It ties up the whole experience. of all the places recommended that you can dine in sagada, i can assure you that only Salt n Pepper is the most accommodating place to have your daily meals. they open as early as you need your breakfast to prep for the day and the only restaurant that stays late as they know that your group is still out exploring sagada. most restaurants closes before 9pm while we were able to have our dinner at Salt N Pepper past 11pm as we finished our cave connection late. I visited Salt n Pepper on a recommendation from a fellow traveller. I was amazed with the experience we had there. The food was prepared infront of us, Andrew had some very interesting insights into Sagada life, and I got to taste the delicious food that Salt N Pepper offers. All up, it is a great place to get a different kind of experience. I would say it was probably the most memorable part of my visit to the Philippines. I will definately visit again. yes basta tumumlong lang kay ate Safe ay ok na tsibog mo. kelangan pa bang magpareserve dito before pumunta? how much kaya mga food dito.. sorry, budget conscious.. haha..
i love their Curry Rice Bowl!! san po to located? and budget n rin..thanks..